4,4'-Methylenebis(N-sec-butylaniline) - ZhangJia Gang YaRui Chemical Co., Ltd.
MDBA Is A Trade Name Of 4,4'-Methylenebis (N-Sec-Butylaniline), A Liquid Secondary Diamine, In Which Hydrogen Atoms On Each Amino Group Are Replaced By A Sec-Butyl Group, Active Hydrogen In A Limited Space The Combination Of Atoms And Sec-Butyl Groups Produces Many Unique Properties, The Amino Moiety Forms The Urea Bond That Affects The Hard Segment, While The Butyl Group Acts As An Internal Plasticizer. It Is Connected With The Polymer Matrix, Neither Leaching Nor Precipitation. While The Alkyl Group Increases The Solubility Of The Diamine So That It Can Be Mixed With Almost Any Polyol And Polyamine. 4,4'-Methylenebis (N-Sec-Butylaniline) -MDBA Can Be Used In Rigid Foam, Soft Foam, Paint, Adhesive, Sealant, Elastomer, Typically Used In 1-5% Of The Polyol. 4,4'-Methylenebis (N-Sec-Butylaniline) -MDBA Can Also Be Used To Spray Polyurea, And A Variety Of Metal And Concrete Repair For The Compound. Bulk Foam - In The Standard TDI And High Resilience Foam Composition, Adding 3-5php Of 4,4'-Methylenebis (N-Sec-Butylaniline) -MDBA Can Increase The Tensile Strength, Tear Strength And Load Performance, In Most Cases, These Advantages In Reducing The Foam Density Can Be Achieved In The Polyester Foam, The Same Proportion Of 4,4'-Methylenebis (N-Sec-Butylaniline) -MDBA Can Significantly Improve Tear Strength And Loadability, While Does Not Affect The Other Properties Of The Foam. Cold Molded Foam - It Has Been Proven In Commercial Applications That Adding 1-2php 4,4'-Methylenebis (N-Sec-Butylaniline) -MDBA Reduces Density And Softens The Foam To Optimize Foam Performance. But Also Can Enhance The Tensile Strength, Tear Strength And Elongation, Shorten The Release Time. Polyurethane Rigid - Use 3-5php Of 4,4'-Methylenebis (N-Sec-Butylaniline) -MDBA In A Water Or Anhydrous Hard Foam System To Significantly Improve The Compressive Strength And Dimensional Stability Of The Foam While Reducing Ease Brittleness, Increase The Porosity, Reduce The Thermal Conductivity. Polyisocyanurate Hard Foam - Adding 5 Phr Of 4,4'-Methylenebis (N-Sec-Butylaniline) -MDBA To The System Can Increase The Compressive Strength By 100% In A High Proportion Of Water Foaming Or Full Water Foaming , The Dimensional Stability Was Significantly Improved. Coating - - 4,4'-Methylenebis (N-Sec-Butylaniline) -MDBA Can Be Used For Room Temperature Curing Of Coatings For TDI And MDI, And A Suitable Catalyst Masterbatch Can Be Used To Produce A Combination System For Spraying And Casting. 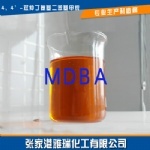 With 4,4'-Methylenebis (N-Sec-Butylaniline) -MDBA As A Curing Agent Formula, Can Improve The Adhesion And Surface Quality. Adhesive - 4,4'-Methylenebis (N-Sec-Butylaniline) -MDBA Allows The Substrate To Be Better Wetted And The Cured Polymer Is Better Adhered To The Coated Surface. The Hard Elastomer - 4,4'-Methylenebis (N-Sec-Butylaniline) -MDBA Can Be Used For The Maturation Of MDI Semi-Prepolymers To Produce A Series Of Elastomers With High Hardness. Soft Elastomers - The Use Of 4,4'-Methylenebis (N-Sec-Butylaniline) -MDBA As A Curing Agent Can Extend The Life Of The Kettle To Produce Soft Elastomers Used As Industrial Sealing Materials. Reducing The Rate Of Gel Reaction, Making It Possible To Produce Such High Hardness Polymers By Spray Casting Techniques. The Extended Gel Speed Can Improve The Adhesion With The Base Layer, The Mobility, The Bonding Between The Coating And The Surface Quality. The Use Of 4,4'-Methylenebis (N-Sec-Butylaniline) -MDBA As A Curing Agent Can Significantly Improve The Low Impact Properties Of Polymer Impact Resistance. Store In A Well-Defined Sealed Container, Placed In A Cool Place, Away From Fire. Use Welding, Cutting Equipment, So As Not To Cause Steam Deflagration. Product Appearance: Deep Amber, 4,4'-Methylenebis (N-Sec-Butylaniline) -MDBA Can Be Used In Rigid Foam, Soft Foam, Paint, Adhesive, Sealant, Elastomer, The Typical Use Of Polyol (5-Methyl-Methylene) -MDBA Is Used To Spray Polyurea, And A Variety Of Compounds For Metal And Concrete Repair. Belong To Several Types Of Dangerous Goods: General Cargo Exports. Tax Rebate: The Current Diethylene Toluene Diamine (DETDA) Tax Rebate Of 13%.